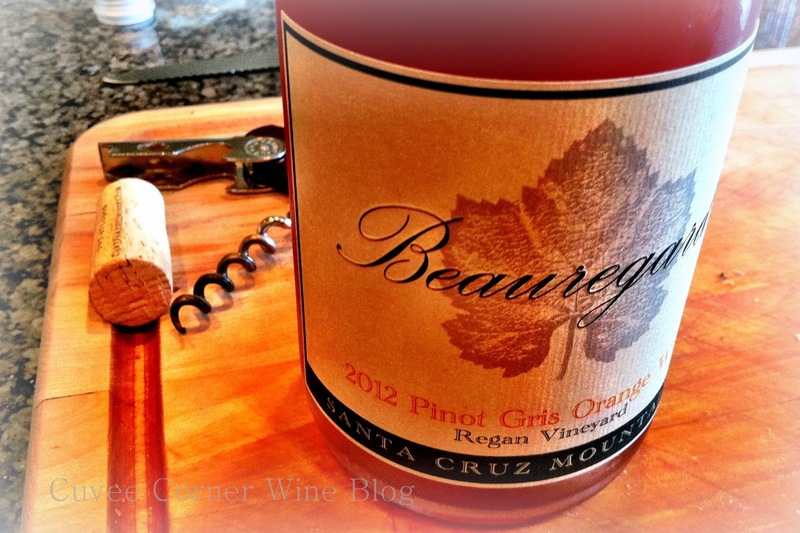 While l love to quote the rather outspoken Ms. Chanel, I have to disagree with her this time, because in the case of Pinot Gris Orange from Beauregard Vineyards [Santa Cruz Mountains] orange is the new black. This is a standout wine, for it's unique approach to Pinot Gris, its unique aromas, and flavors. This was the first time, I've had the opportunity to sample wine like this. Frankly, I had no idea what to expect. I really did like where it took me tho. This wine represents the perfect mid-March springtime review, while it's still cool outside here in Southern Oregon, my palate was treated to the summertime sipping delights of the Regan Vineyard, Pinot Gris Orange. The nose itself I thought was quite captivating, it again reminded me of another Chanel quote. The nose is pretty unique, burnt dried orange-peels, new baseball mitt [freshly oiled] but not off-putting, a funky-monkey that will captivate and compel sip after sip and perhaps even the occasional slurp. It's a wine best served chilled, but not too cold. On the palate, bone-dry, high-acid, more citrus and a distinctive dried orange skins, textured tannins and an elegant ground minerality. On the long lasting finish, a very compelling blood orange thang. In response to the question posed via #winechat "as for whether this style of wine is a love and/or relationship" my immediate thought was that, "it's definitely a niche item, but a great #wine for adventurous minded vino-sapiens." But I'd definitely say. Further, most wine drinkers don't use the word the word "hate" when speaking of wines they don't like, with the possible exception of cheap bulk wines posing as the real thing. They tend to use words or phrases like, "that's not my cup of tea," or I don't prefer that style of wine. Something much akin to my general disdain for much of the domestic Sauvignon Blanc I encounter. The recommended pairing for this wine is Havarti Cheese, because of its creamy texture, wines high acid and red wine like tannins are perfect pairing partners. I, unfortunately, did not have any of that cheese on tap, seeing I'd not done the required shopping ahead of time. But what I did have was, what they call in Hawaii plate lunch something which is varied as the islands themselves. Thanks to the lovely and fetching Mrs. Cuvee I've got this dish dialed-in good as any you'd find while traipsing across the islands. I had prepared fresh made Chicken Katsu Curry. I use fresh chicken breast instead of thighs, it's a bit healthier. It's served with white/brown rice, that's sprinkled with Nori Komi Furikake and the "golden" curry [which comes in different heat levels] which is partitioned in bricks you break off and bring to a boil in water. 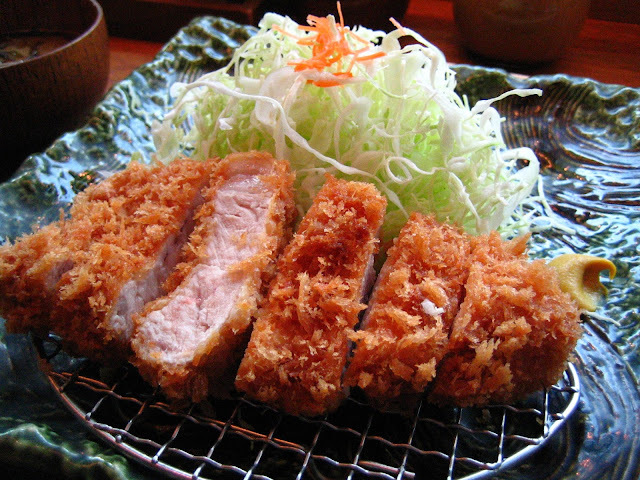 The preparation of the chicken is critical; cut the breast into strips, rinse in water, dredge in flour, dashes of salt and pepper, then the chicken is then thrown into a bowl of beat eggs [1-2 max] and then it hits a bowl of panko [Japanese style bread crumbs]. Once those steps are complete, then it's time to "fry" best done in a large skillet, filled with 3/4 cup Avocado Oil. The fillets cook rather quickly over moderate heat, so have a paper towel-lined plate ready to go take on the perfectly cooked fillets. As for the rice, that is so easy. First put away that box of Uncle Ben's and bust out that rice cooker you received when you were married the first time. Bust out the bag of Cal-rose [Japanese sticky rice] pour in two cups and then add water [rinse twice] from the tap, put your finger into the bowl touching the top of the rice. The water level over the rice should meet the first crease [critical] of your finger, hit the cook button and in about 20-25 minutes you'll have perfect sticky rice. You're now ready to get those fillets on the cutting board, take a sharp knife and cut the fillets into bite-size pieces. Cover it with piping hot curry, add a small scoop of rice, hit rice with the Furikake, add some steamed edamame and you're all set to have plate lunch perfection. Now going back to the wine, its dryness and crisp acidity paired perfectly with the dish. It's now my recommended go-to pairing. Give it a try yourself, and let me know what you think. Until next time folks, remember life is short so sip long and prosper cheers! Full Disclosure: This wine was sent as a sample for the review process.